A grandma named Jeanne decided she wanted to have a little fun with her grandson and film a light-hearted video. Little did she know, it was going to go viral and be viewed over 1.8 million times. Jeanne starts with the introduction saying, “this video is dedicated to the late Whitney Houston.” Then the music begins, it’s Whitney Houston’s “I Wanna Dance with Somebody.” A groovy tune that no one can sit still for. 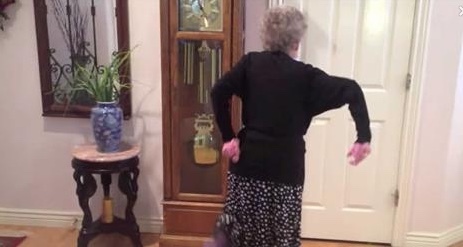 The adorable granny starts busting a move as soon as the tunes come on. It’s clear that dancing is one of her favorite things to do. Her grandson, Adam Forgie, is the one filming behind the camera. Adam also said that his grandma had a steel hip put in as well. This helps her keep up those dancing moves! As the music continues, she continues to cut a rug in the cutest way we’ve ever seen. Then, she asks her grandson to join her! It’s not long before Adam joins her in the frame and they are both busting a move; although, Adam mentions that his grandma is a much better dancer than him. Sorry, Adam! We have to agree. Watch the sweet moment below and see why millions of people have fallen in love with Grandma Jeanne and her awesome dance moves. She’s clearly been dancing for decades and it shows. Her love of Whitney Houston is adorable too!